Billy Coffey’s two novels titled, The Devil Walks in Mattingly, published in 2014 along with In The Heart of the Dark Wood. When Mockingbirds Sing is not as exciting to me personally as the other two books. The other two tales have tons of action, adventure and suspense that tend to keep me glued to the book more than the slower building storyline. This story is about a little girl who has a speech impediment and tends to shy away from crowds plus her parents don’t seem to be getting along well. Only little Leah can see a figure she calls the Rainbow Man who sings to her. No one else can see what she describes or refers to when she tells others about Rainbow Man. Another obstacle for Leah and her family in the small town is that they came from outside the town of Mattingly, which can make fitting into the nuances of a small town challenging. 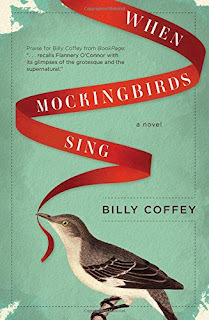 Perhaps because I read Billy Coffey’s latest work, this one didn’t really hold my interest as well or the way the beginning to the story starts. Whatever the reason, it still made for an interesting tale to read and think about what the author might be trying to convey in the book’s themes. I felt like I was dropped into a story without much leading in the way of how Leah and her family got to this town. I will keep this novel on my shelf in my personal library to read again in years to come. A lot of my time while in the story was trying to figure out who the Rainbow Man is supposed to represent and why is Leah the only one who sees and hears him? For me, I prefer action, suspense, thrillers with some mystery, but this tale just didn’t seem to flow or make sense to me. Like all reviews on books it depends on a lot of variables and the person reviewing the book. I can see why reviews are from one spectrum to the other. Readers seemed to either love it or thought it was okay at best. All I can say is the latest books written by Billy Coffey are much better and very captivating! Coming this August from this author is a novel titled, The Curse of Crow Hollow. Will you be reading this latest from the author’s pen?